born January 30 1917, died January 28, 2003 aged 85. At the time, Frank Spaven's passing came as a surprise. Although he had not been well during the autumn he had resumed his weekly visits to the local Planning Department to inspect Planning Applications on behalf of the Inverness Civic Trust. He had attended the Friends of the Far North Line committee at Alness on 27th November. Frank had been our Vice President from the outset of the Society's existence. Frank conducted himself with courtesy and humility. Although having increasing difficulty with hearing he was always ready to reflect a lucid comment during committee discussion. His background knowledge of the railway, and particularly the rural railway was valued. More particularly his understanding of public affairs enabled him to place the interests of the railway in a wider socio-economic context. He had a recognition of people, offering suggestions, time and wisdom. Frank D. N. Spaven was interested in railways from boyhood in south-east Scotland. During the 1939-45 war he surveyed the state of the Hejaz Railway in the Near East. From the Scottish Railway Development Association of the 1960's to the Scottish Association for Public Transport of recent years he radiated a reasoned concern for the use of rail transport in Scotland. In later years he drew on comparative knowledge from Scandinavia and New Zealand. He was a keen observer maintaining photographic records. It was not until the obituary notices began to appear in the Scottish newspapers that members of the Friends of the Far North Line Committee fully realised the contribution which Frank had made to the retention of Scotland's railways. In the years following the Beeching Report only cool reasoning could win the day and this Frank applied. We have been grateful to know a gentleman and a friend. 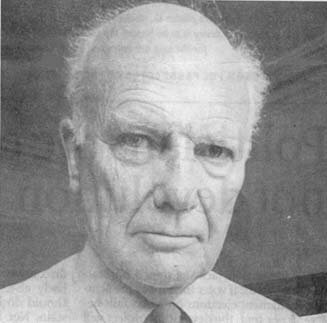 Frank Spaven, first head of planning at the Highlands and Islands Development Board, was instrumental in saving the bulk of the Highland rail network from closure, and successfully lobbied to rescue the Kyle line from a second threat. There was a more sinister side to the Beeching axe, which Spaven's efforts thwarted. In 1962, a year ahead of Beeching's report, The Future of British Railways, planners in the Scottish Office had already earmarked Highland railways for disposal so that trackbed could be used for road improvements. When, under the 30-year rule, these reports were released for public viewing in 1993, reporter Allan McLean noted that many of the handwritten notes in margins carried the initials "F S". He identified Spaven, and wrote an illustrated feature entitled, The man who saved the Highland railways. Beeching's plans to sever all railways north of Perth plus the Mallaig line had produced a colourful alliance fighting closure. This included organisations such as MacPuff, the Highland Vigilantes, local Councils and Members of Parliament. In his backroom role, Spaven's particular talent lay in marshalling intelligent arguments in fluid style, tellingly and without passion, and his many reports forced governments of both colours to re-examine transport priorities. While the Beeching closures relied on nebulous "hardship", Frank reported firmly on the social impact of closure, and the effect on the local economy. An innovation was his use of environmental impact in his cases. When appointed head of planning and research to the new-born HIDB in 1966, he took every opportunity to put these ideas into practice. The successful outcome relied on Spaven's sanguine habit of not clashing with the roads lobby, but countering with cold fact that road and rail both had their places, and how each was necessary for success of local economies. Spaven dismissed sentiment, rather highlighting the key role of railways as a green and civilised form of transport. His cogent arguments to ministers won the day, and the future of railways in northern Scotland finally became assured. Educated at Daniel Stewart's College and Edinburgh University, Frank Spaven inherited an interest in rail from his father, and as a boy watched trains from a signal box at Innerwick in East Lothian. As a civil servant within the roads- dominated Scottish Development Department, he carefully constructed arguments for the need for rail in regions of Scotland, and gave assistance to arm's-length bodies such as the Scottish Economic Development Council. His faith was important to him, and he was a kirk elder of many years standing, while maintaining an interest in Third World issues. Frank was proud to be a vice-president of the Scottish Association for Public Transport, and last year attended the AGM of TRANSform Scotland, the campaign for a sustainable transport policy, where his elder son, David, was in the chair. He died suddenly two days short of his 86th birthday and is survived by his wife, Sheila; sons, David and Malcolm; and grand-daughters, Lauren, Isobel, and Catriona.